Play a key role in giving children and young adults the best start in life and preparing them for the future. Our real-world courses equip you to step into your career with confidence, continue to learn, innovate and explore new opportunities, or lead the profession and influence positive change. OP and selection rank thresholds are only a guide, based on the lowest adjusted scores to which QUT made an offer in Semester 1, 2018. Courses may be harder or easier to get into each year, depending on their popularity and how many places we have available - it's about supply and demand. We're a future-focused university, so you know you'll learn to push boundaries, be curious, innovate, and incorporate digital technologies in your teaching. You'll be prepared to tailor your teaching to ensure all learners are reaching their full potential. Our award-winning lecturers have a wealth of knowledge and experience to set you on the right path. Courses benefit from the expertise of our researchers and their work to advance knowledge and influence change in education policy and practice. Entrepreneurial thinking and leadership capabilities are key inclusions in our teaching courses. To help shape your career and be at the forefront of innovative teaching practice, you can continue to learn as your career develops. Our professional development and postgraduate courses provide a range of practical knowledge in key capabilities and emerging topics. "I have the honour of being an important person in young lives and strive to provide a learning environment where every student can reach their potential. 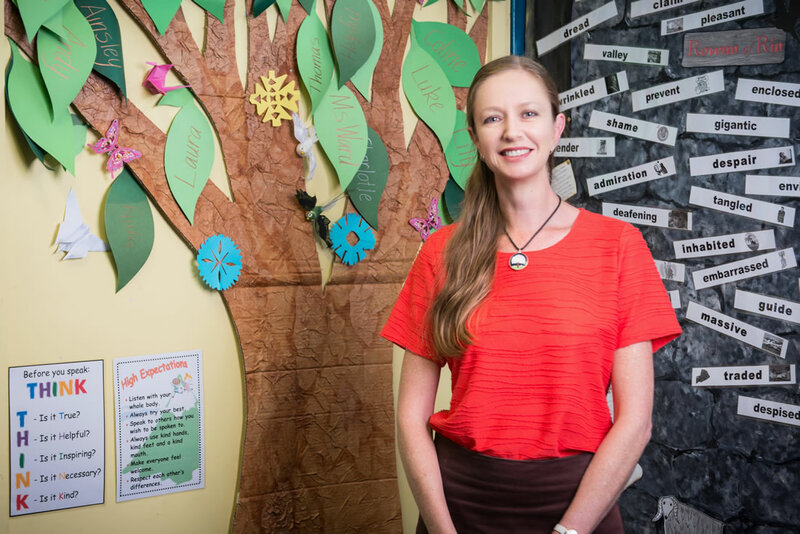 QUT equipped me to teach a class of diverse learners and I regularly receive feedback about the welcoming feeling of my classroom." Teachers play an important role in preparing the next generation for the future. Our education degrees ensure you can step into your career with confidence and make a difference. Be prepared to teach in the classrooms of today and the future, and explore a world of opportunities. Latest figures show over 98% of our undergraduate education graduates were employed four months after graduation (QILT website February 2018). The early years are a time of rapid growth and development, which is why early childhood teachers play an important role in giving children the best start in life. Be highly sought after, and deliver high-quality early childhood programs in childcare settings, kindergarten and primary schools. Make a significant contribution to the lives of children. Demand for graduates is growing and our course is flexible and responsive to your needs. Teachers provide the foundation for lifelong learning in young minds and prepare the next generation for the workforce of the future. Our hands-on and experience-driven course will allow you to step into the classroom with confidence, and continue to adapt to ongoing workforce changes and future opportunities. Provide a foundation for lifelong learning in young minds. With extensive real-world experience you’ll be qualified to teach Prep to Year 6 in primary school. Secondary teachers contribute to the development and further growth of young adults. Our degrees allow you to choose two teaching areas to maximise your employment opportunities. Our expert teachers will encourage you to be curious, innovate, and create the best learning opportunities for your students. You’ll be prepared to step into the classroom with confidence, or explore a range of career directions. Contribute to the development of young adults and share your passion for your teaching areas. Undertake extensive real-world experience and specialise in two teaching areas. Combine education and business for careers in secondary school teaching with business as one of your two teaching areas, or in the business world. Combine education and creative writing for a teaching career, explore other opportunities in educational settings, or create content for the creative industries. Combine education and dance for a teaching career, explore other opportunities in educational settings, or create content for the creative industries. Combine education and drama for a teaching career, explore other opportunities in educational settings, or create content for the creative industries. Combine education and film studies for a teaching career, explore other opportunities in educational settings, or create content for the creative industries. Combine education and music for a teaching career, explore other opportunities in educational settings, or create content for the creative industries. Combine education and visual arts for a teaching career, explore other opportunities in educational settings, or create content for the creative industries. Combine education and IT to work as a secondary teacher with IT as one of your two teaching areas, or in roles applying new technologies to business or education enterprises. Teachers play an important role in preparing the next generation for the future. You can fast track your teaching career by completing education and curriculum studies to complement the knowledge from your previous qualification. Our education courses ensure you can step into your career with confidence and adapt to ongoing change and future opportunities. The early years are a time of rapid growth and development, which is why early childhood teachers play an important role in giving children the best start in life. You can bring knowledge from your previous qualification and fast track your teaching career. Our course will put you in the box seat for leadership in the early childhood education and care sector, and prepare you to teach in primary schools. Teachers provide the foundation for lifelong learning in young minds and prepare the next generation for the workforce of the future. You can bring knowledge from your previous qualification and fast track your teaching career. Our course will give you the key capabilities to tailor your teaching for diverse learners, create positive learning environments, and step into the classroom with confidence. Secondary teachers contribute to the development and further growth of young adults. You can bring subject knowledge from your previous qualification and fast track your teaching career. Our courses will prepare you to be an inspiring and innovative teacher and develop your professional identity so you can step into the classroom with confidence. As a current teacher or educator, you can gain specialist knowledge and continue to develop innovative teaching approaches to make a positive impact on learners. Our real-world courses give you the opportunity to meet your professional development needs, change career direction, pursue your career ambitions, or influence change in education practice. We offer a range of short courses to boost your professional practice. Explore our on-campus and online options.